The Vengreso 10 step digital sales program is uniquely designed to get the buy-in you want from the sales team. Our proven method creates behavioral change and measurable outcomes that prove return on investment. Review the diagram below along with the explanation of each step. Think about the game-changing impact a digital sales strategy can have on your sales team and their results. Behavioral change is critical to the success of digital sales transformation. The best method for changing behavior is identifying the organization’s goals, and then measuring and reporting on the behaviors tied to them. Prior to launching a digital selling program, the first step is to identify the sales organization’s goals and its success metrics, and then determine how these will be measured. The focus should be on KPI’s, along with making adjustments to the CRM to track them. Built into effective CRMs are tools that help salespeople open opportunities. EveryoneSocial, LinkedIn, and Sales Navigator among others, are tools used to open opportunities while tracking their impact and use. Because different tools may be used throughout the opportunity process, adding a compulsory pop-up when the opportunity closes is another way to obtain reliable data, and again, another means of measuring a tool’s ROI. The “tools” field is also effective in measuring KPIs of each of your tools and how they are used to fill the top of the funnel with prospects and in closing deals. KPI’s should not be limited to revenue performance. In digital selling, goals are geared toward creating more sales conversations with more qualified buyers using tools that track their use and impact. InsideView, Outreach, LinkedIn, and SalesNavigator are examples of prospecting tools salespeople should be able to select in their CRM. This should be a mandatory field that measures the use and impact of tools used for setting up appointments. To maximize success, these goals should be established with executive buy-in from sales leadership and the frontline sales managers. It is critical that sales managers are given clear expectations in order to monitor and measure their salespeople’s performance. Another key success metric is broadcasting the accomplishments of high performers through a gamification / recognition plan to motivate sales teams to reach their goals. Sellers need a vehicle for sharing stories, discussing best practices, giving feedback and asking questions. Consideration should be given to the communication channel and how it will fit in with your sales culture. It is important to identify buyer types by persona and / or vertical industry and how you engage them by sales role. Verticals might include: small/medium business, enterprise accounts, industry specific and/or multi-channel groups. Sales roles might include: sales development rep, account executive, small business account executive, key account manager, etc. From a tactical perspective it is critical to create buyer personas that include titles, their business pains, and also keywords associated to their topical interests. Specific details should be identified as they will be used to determine the content production plan (explained in the next section). They also help to define what clients are searching for online. These insights provide a framework for deciding the types of additional filters to use when developing Boolean logic search strings for prospecting on LinkedIn. Step three is the most critical element of the 10-Step process… Note, that this step should occur BEFORE you conduct training (step 7)! Disregarding or short-selling this step greatly reduces the chance of successfully implementing the remainder of the Digital Sales Transformation Plan. In order to connect and engage buyers on their terms, it is vital to develop a content strategy that maps to their journey and pain points. The buyer’s journey includes the following phases: awareness, consideration, and decision/purchasing. When developing content for each of these phases, it is crucial that content serve as a resource for buyers uniquely in each phase of their journey. Content should answer questions and provoke critical thinking. It should provide useful tips, define terminology and concepts, suggest when to take action to solve a specific pain, how to avoid mistakes and give buyers a reason to want to consume your content because it’s helpful to their journey. Valuable content answers the why, the how-to, the what-to, and the when-to questions. Vengreso advocates a “vaulted content” approach whereby content is stored in an online platform that is accessible to Sales by login. Adding a robust repository of content assets – complementary to your existing content marketing assets – for private messaging with buyers as well as social engagement enables sales teams to quickly share content with people in their social networks. Content developed for use by sales is the most valuable content to produce because it’s used to create and sustain conversations with buyers. Digital sales tools are a critical success factor in digital selling. We recommend licensing LinkedIn Sales Navigator for all sales employees to allow leaders access to each salesperson’s networks. This tool reveals the entire breadth of everyone’s connections across all sales teams, and accelerates the connection power of the sales organization because each connection will be visible to all users resulting in better collaboration and a stronger overall network. Employee advocacy tools such as EveryoneSocial or GaggleAMP can increase adoption of content sharing across the entire employee population, maximizing its potential. This might require having an enterprise-wide license for all employees. Another key tool that can set you apart from your competition is a video sales acceleration tool such as OneMob. We recommend this platform partly because it includes sales landing page technology with robust metrics to know who has viewed your content. We also recommend deploying an online calendar that is fully integrated into the Outlook or Gmail calendar system to make it easy to schedule appointments. Additionally, we also recommend deploying an auto text expander tool to create memorized shortcuts for often-used words or phrases used by salespeople throughout their digital selling activities such as messaging to new LinkedIn connections. These tools represent must-have components of your successful Digital Sales Training program. Simplicity is very important to sales reps. That’s why we recommend developing customized playbooks to streamline the digital sales onboarding processes. A LinkedIn Profile Makeover should be the first playbook introduced because it includes everything needed in each sales rep’s profile. The user only needs to copy the content that was professionally written for them and paste it into their profile. Vengreso LinkedIn Profile writers write the content and your marketing team supplies rich media assets. The next playbook in the digital sales process contains messaging templates, scripts and search strings that map to the buyer personas defined in step two. 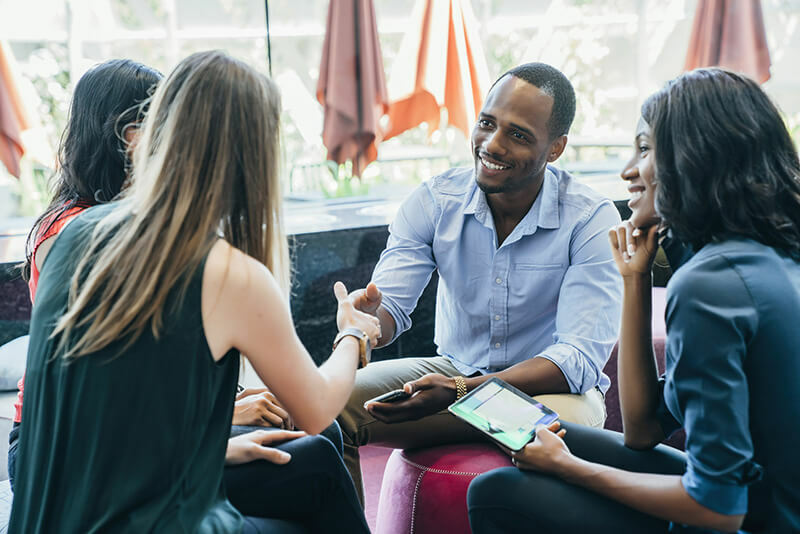 Each salesperson needs to know what to say when connecting with a potential buyer. The playbooks should contain templates or guides for creating InMails, messages requesting a referral, and other forms of sales engagement, e.g. birthday messages, etc. Our professional writers write the messaging playbook too. In addition to simplicity, sales reps value lessons learned from their peer’s successes. That’s why we also recommend creating a playbook made up of sales success stories that originated through digital selling practices. The stories should include how the sale was achieved, which digital tools were used in the process, and other variables to teach other salespeople tactics and best practices for successful digital selling outcomes. Our professional writers also write the success stories playbook. The outcome of creating playbooks is a scalable and repeatable sales cadence that ensures each salesperson knows exactly what to do, when they need to do it and how they need to do it throughout the selling journey. The key is keeping it simple for the sales reps so they can easily implement the elements of each playbook. A buyer-centric LinkedIn profile is the result of transforming a resume style profile into a resource page on LinkedIn. Each salesperson’s profile should be written through the eyes of their buyer, which means phrases like “quota crusher” or “great negotiator,” aren’t included. Instead, the profile should use phrases that demonstrate knowledge of the persona’s needs or of the needs of their vertical industry. To establish credibility and trust, use terms that show care and understanding of the buyer. Using buyer-centric words also increases the probability of being discovered when the buyer conducts a keyword search. This is called LinkedIn SEO. LinkedIn profiles should showcase client case studies through rich media that relate to the buyer’s problems and should also include a clear call-to-action that drives engagement. A strong LinkedIn profile communicates value to the buyer. Another way to look at the sales rep’s profile is like a mini website for your company. If you have 100 sales reps, that’s like having 100 additional websites that are on-brand and SEO rich. Here we are… Now, we’re ready for digital sales training. With the first six steps in place, the sales team is eager to dive into the training because the simplicity of the process is obvious and so is the potential power of digital selling. Digital sales training should be customized by sales representative type. For example, inside sales, enterprise sales, channel sales, vertical industry sales, each should go through the training customized for their role. The training should be specific to each group so that each one will embrace it and put it into action. The optimal approach to training is through a three-part program using On-Demand, which is a a self-paced guided online learning program; Instructor Led live training, which can be in-person or virtual; and Live Coaching for reinforced behavioral change. This three-part training program supports the six phases of transforming businesses into modern sales organizations. This three-part training method comprised of On-Demand, Instructor Led Training and Live Coaching is the most optimal cadence to achieve behavioral change. In step one we mentioned the importance of motivating sales reps to accelerate adoption. Recognition of success is key to this. And, gamifying digital selling is key to spreading the word. We recommend setting up KPI reinforcements such as new connections, SSI score growth, referrals requests, etc. Then, build and present leaderboards with incentive prizes such as cash or non-monetary rewards such as paid time off or donations to their favorite charity, etc. Company communication tools such as Slack, Salesforce Chatter, etc., are recommended to recognize high performers and to motivate sales people to reach their goals. Vengreso’s On-Demand system includes a built-in communication tool for easy collaboration. Referring back to step one, changing behavior to achieve digital sales transformation occurs through ongoing measurement. This is why we recommend reviewing KPIs weekly with a focus on consistent improvement. Video and social engagement by sales reps should be recorded in the CRM for reporting, and for enabling leadership to identify what is and isn’t working. Using these insights, the playbooks should be adjusted accordingly. Identifying positive and negative outcomes is paramount to keeping the playbooks up to date and ensuring salespeople are achieving sustained behavior change and are as effective as possible in their digital selling activities. To create long lasting behavioral change, salespeople should receive ongoing coaching to reinforce successful behavior and overcome areas that need improvement. Most sales leaders are skilled at coaching reps on activities such as account planning, presentations, contract negotiations and even closing. But we’ve found that few sales leaders have the experience to deliver effective digital selling coaching. That’s why we suggest sales leaders reinforce the coaching that salespeople receive from Vengreso in the context of their overarching sales strategy and their culture. Leaders should use the data obtained from the CRM as the guide to coaching and focus on fundamentals such as creating more conversations, which will lead to more opportunities. Why Vengreso’s 10 Step to Digital Selling Program? The Vengreso 10 Steps to Digital Selling Program won the Gold Stevie Award for the best sales training product of the year in 2019! Contact us to discuss your digital sales program.